Having explored the Silk Road previously, the Caucasus called to us. Parts of it are an extension of those trade routes that took goods from East to West. ...early Christian and ancient civilizations. And glorious vineyards. Wine has a long, long history here in the Caucasus. And its Caucasus Mountain range acts as a natural barrier between Europe and Asia. You're closer to the Christian west. The mountains range from high peaks and rugged, to semi-desert areas. It’s all beautiful. Azerbaijan, Georgia and Armenia. While they all share the geography, they each had their own personality and history. Once again we joined a small group tour. Not all three of these countries like each other, and we didn’t want to have any trouble crossing borders. A tour also teaches you so much in an area that is so unfamiliar. 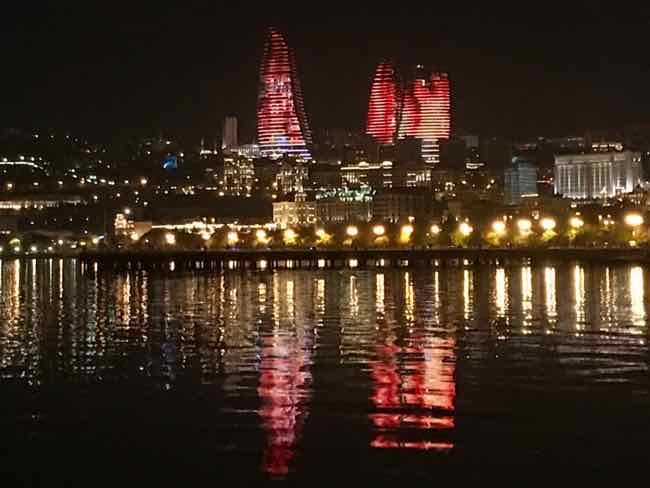 The capital, Baku, is known as the City of the Winds, but it wasn’t windy when we were there. 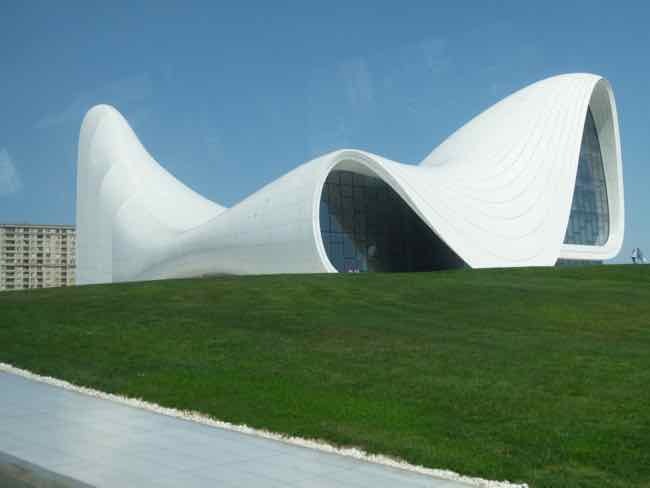 It sits on the shore of the Caspian Sea. ...and caravansaries (which have been converted into comfortable restaurants). 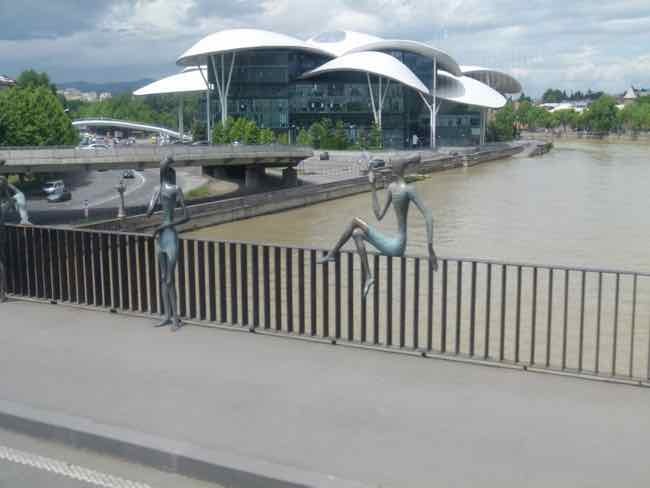 The new city is very modern and comfortable with amazing buildings like “the Flames” Towers and the Cultural Center. And if you like Oriental Carpets and Kilims, the Carpet Museum is certainly worth a visit. Near to Baku is the town of Surakhani where there is a Fire Temple which may or may not be associated with Zoroastrianism. On the drive towards Georgia we visited a previous Azerbaijani capital... Shemakha. The cemetery next to it has royal tombs of the 18th century Khans of Shemakha. Further along, we arrived in Sheki. Sheki is a delightful small town that was founded over 2,700 years ago. 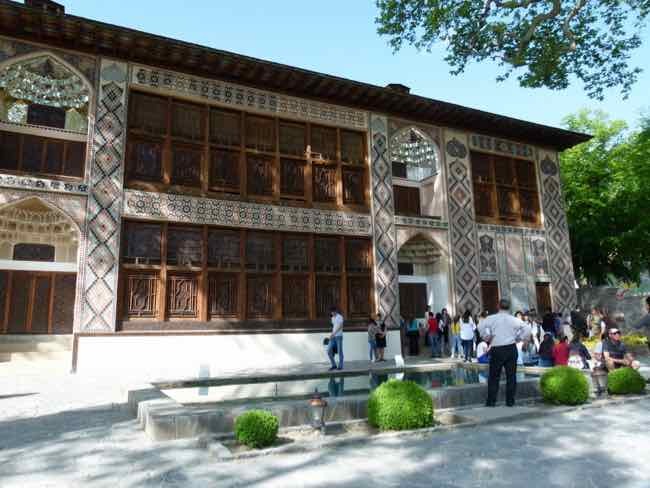 It boasts a jewel of a palace: Khan's Palace (Xan Sarayi) from 1762. 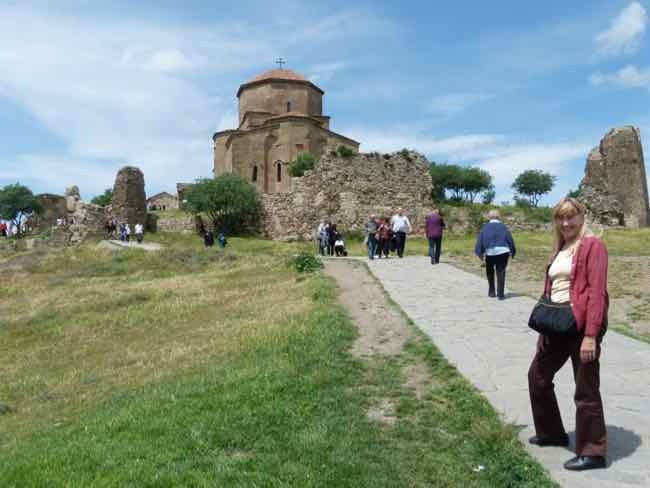 The first place we visited was the Alaverdi Cathedral. This church was built in the 11th century, but it replaces a much older one… the monastery was founded in the 6th century. Now we passed through the wine region of Georgia. Wonderful wines made from grapes that we had never heard of before. Georgians Were Early Early Winemakers! Did you know that Georgians believe they were the first to make wine? There is an ancient amphora in the museum in Tbilisi that supposedly contains the chemical residue showing it contained wine 8000 years ago or about from 6000 BC. And yes, there are places where you can go wine tasting. Saperavi became our favorite red wine in Georgia! 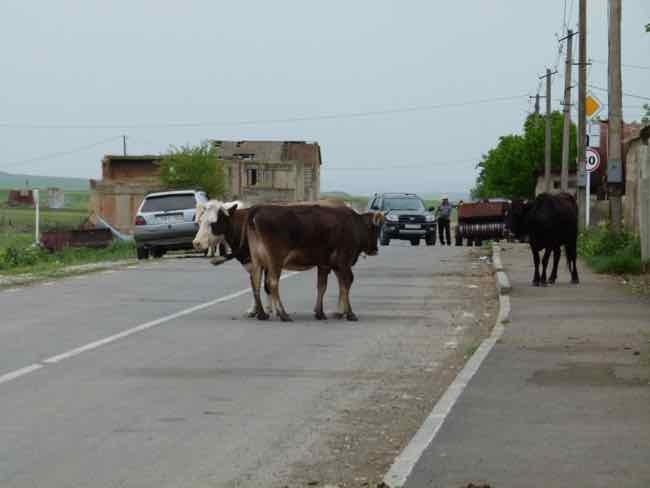 There were lots of rural roads with sheep and shepherds along the way… and cows. 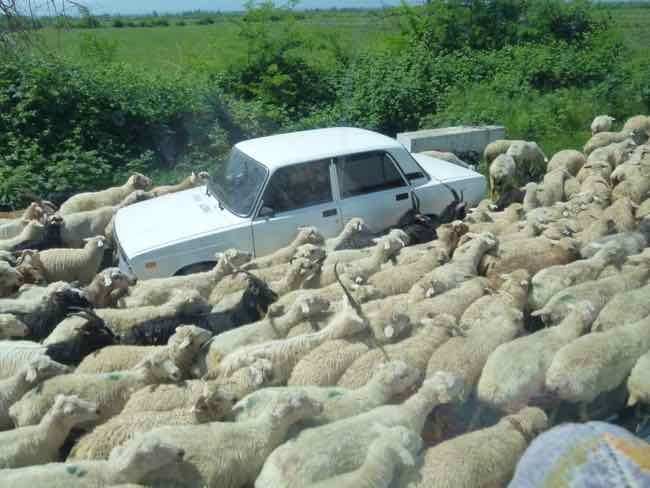 You just never know what’s going to cause a traffic jam! That’s part of the fun of travel, isn’t it? 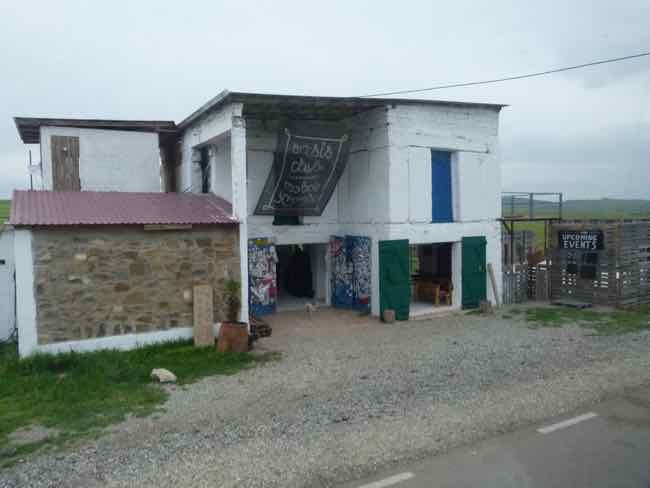 We were really out in the middle of nowhere… even for lunch (and to change a bus flat tire!) Check out the Oasis Club. 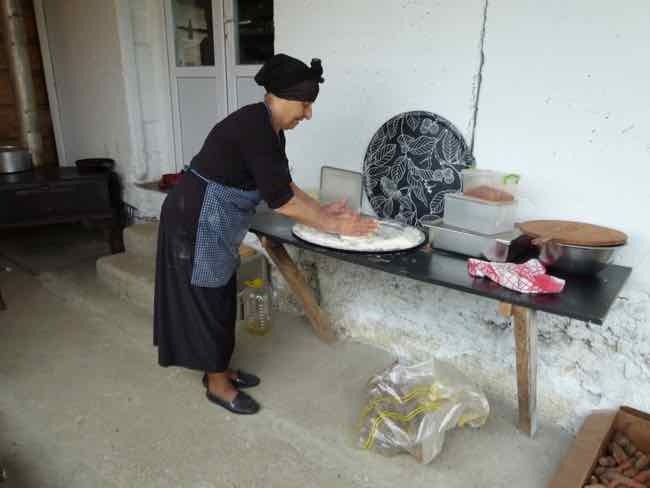 Surprisingly, the food was good… this little old lady made a mean Khachapuri (cheese pies). 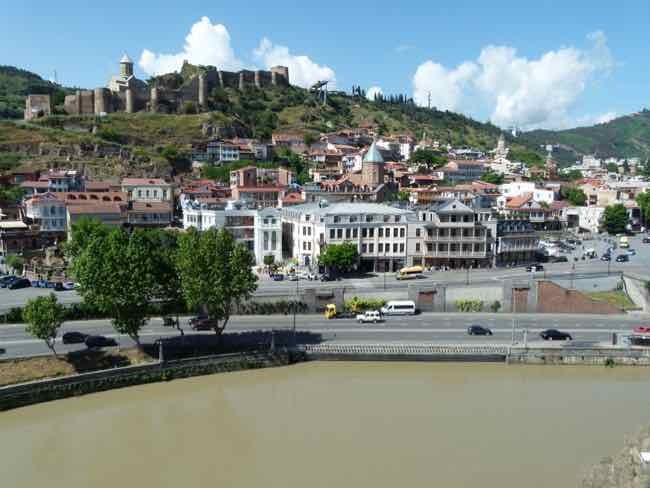 The capital of Tbilisi is delightful. It was was the capital of Georgia from the 5th century, and was a key stop of the Silk Road. The Old Town has a wonderful mix of cultures… The mosque, the synagogue, the Armenian and Roman Catholic churches mingle harmoniously. There is a fortress overseeing the Old Town. And in the Old Town are sulfur baths and ethnic markets which give the city an East meets West feel. The modern buildings in town give it a very cosmopolitan ambience. Traveling through the country to the High Caucasus Mountains to the little town of Kazbegi, there are monasteries galore. Jvari Monastery is, to many Georgians, the holiest of holies. It stands where King Mirian erected a wooden cross soon after his conversion by St Nino in the 4th century. You can also visit Gori. The city is not all that much to look at, but it is interesting because it is the birthplace of Joseph Stalin… and you can visit the Stalin Museum. 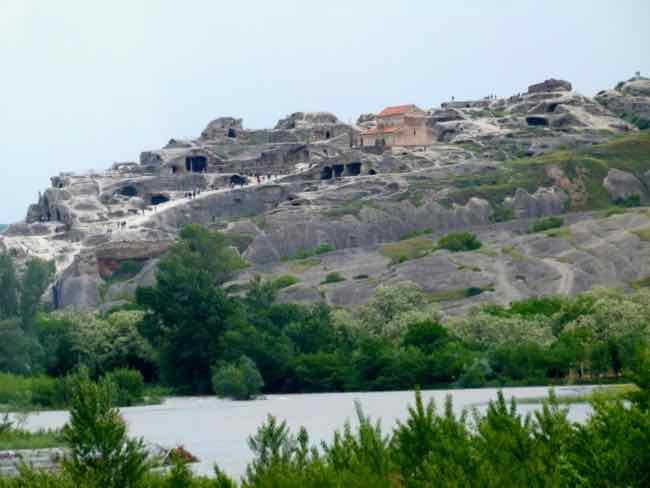 More interesting to us was Uplistsikhe, a cave town carved into the rock face of the mountain. It dates back to the 7th century BC and was another strategic point of the ancient Silk Road right up until the 15th century AD. 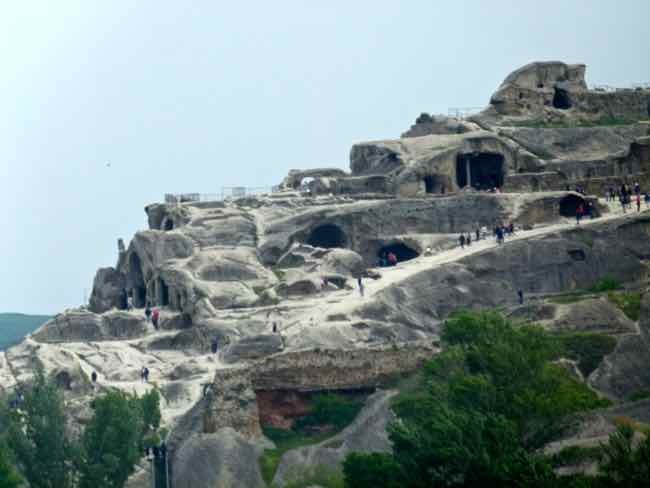 But wait… that’s not the only cave city. 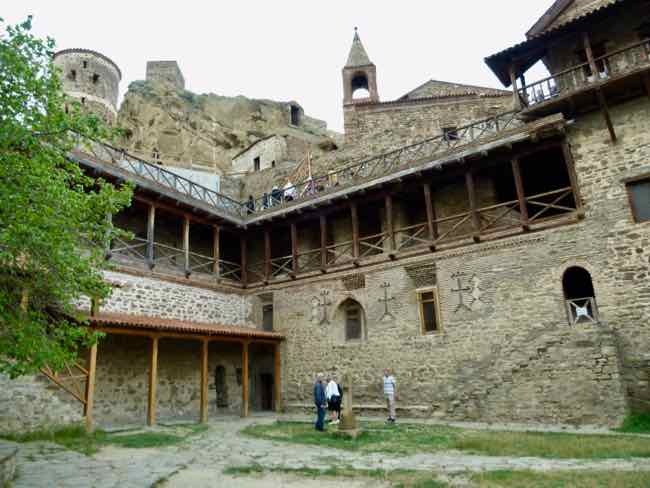 You can also visit Vardzia in southern Georgia. 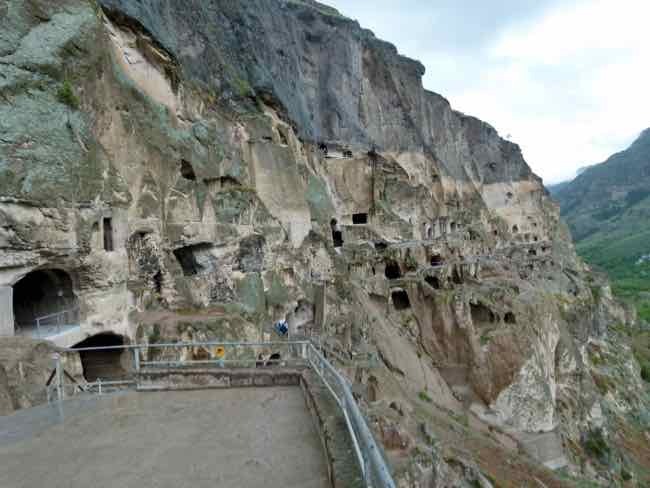 This cave city is 13 stories high and was built between 1186 and 1189 by a famous Georgian Queen Tamara. Really amazing to climb around in. 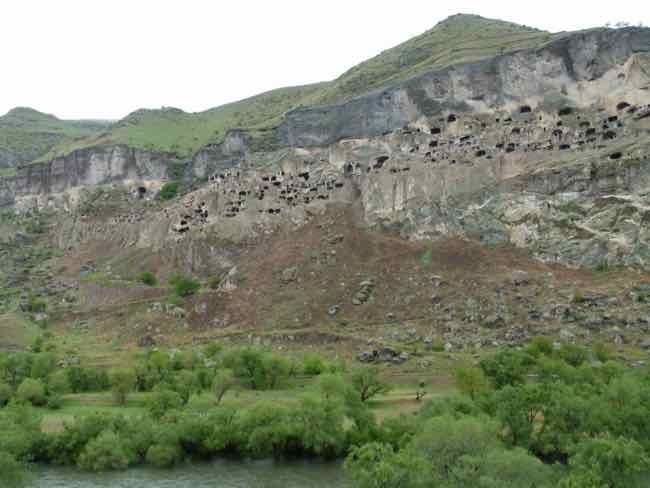 If you want to visit those two cave cities in Georgia, you will enter Armenia through a little used check point and probably stop in the city of Gyumri. It's only worth a stop to break up a long drive. 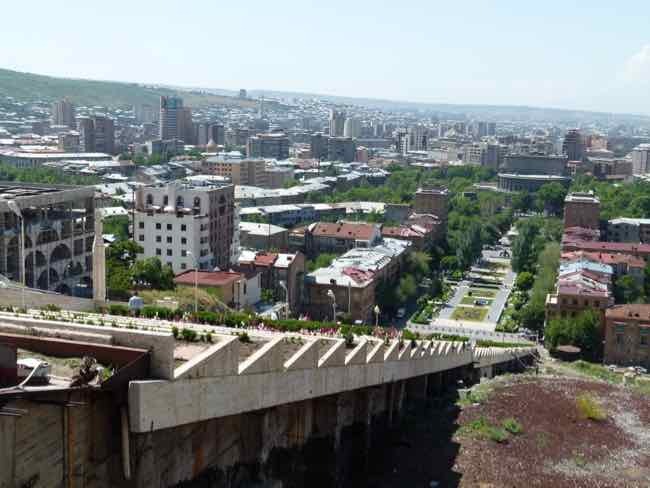 Your destination should be Yerevan, the capital of Armenia. 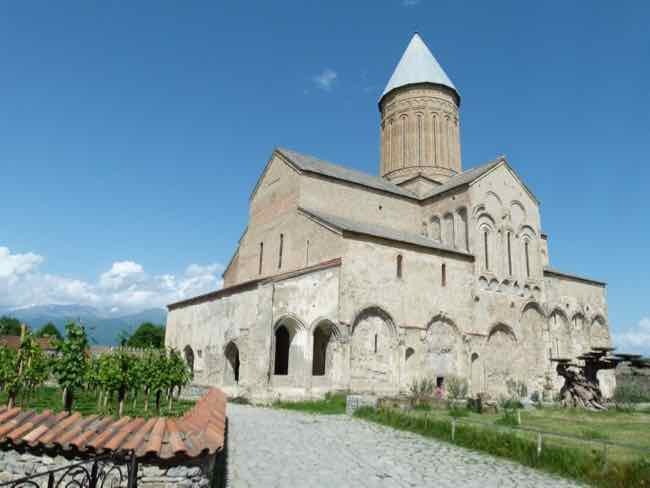 Armenia was the first country to adopt Christianity as a state religion in AD301, so there are lots of Christian monasteries and cathedrals to visit. 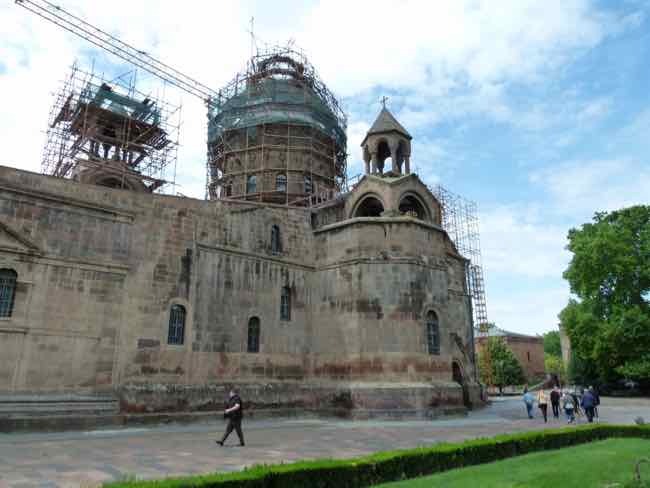 The Mother See of Holy Echmiadzin is considered the “Vatican” of the Armenian Apostolic Church. It's on the outskirts of Yerevan. Armenians Made Early Wine Too! The Armenians make a fair amount of wine too… and have some claim to an early start. I mean, how about this quote on a plaque in a brandy factory…. 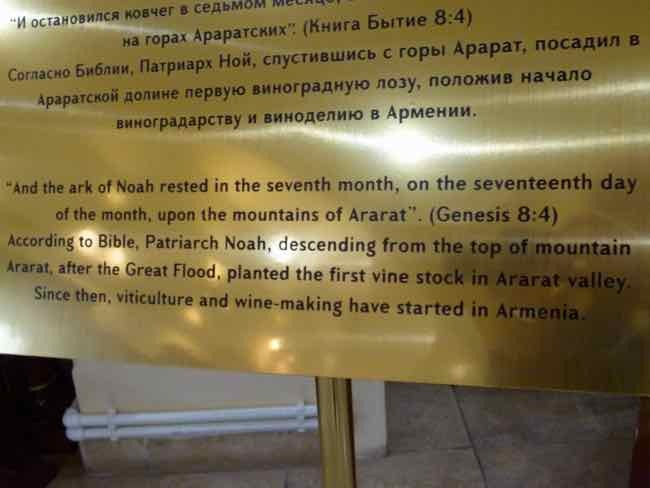 According to Bible, Patriarch Noah, descending from the top of mountain Ararat, after the Great Flood, planted the first vine stock in Ararat Valley. Since then, viticulture and wine-making have started in Armenia. Well… OK then. The Armenians in Yerevan do have a fabulous view of Mount Ararat. Something which gripes them most of the time because they believe it should be in their country, but it is in Turkey for political reasons that go back decades or more. 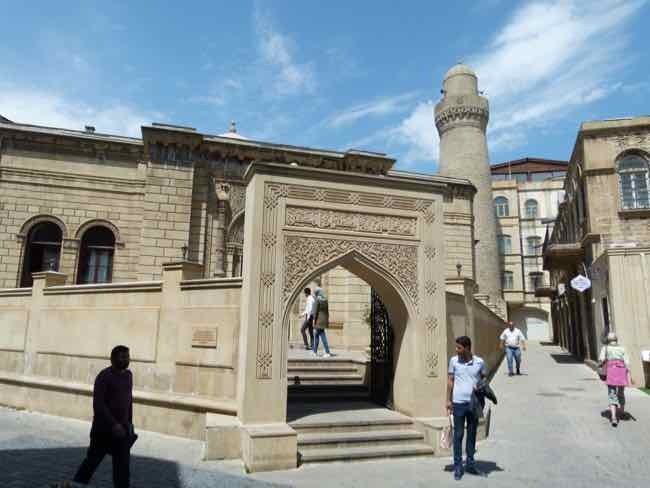 There are many wonderful museums in Yerevan, and you probably will not get out of the country without visiting the Genocide Memorial and Museum. Outside of Yerevan, in two separate directions, are the Geghard Monastery which is carved out of the rock face of the Azat River Gorge…. 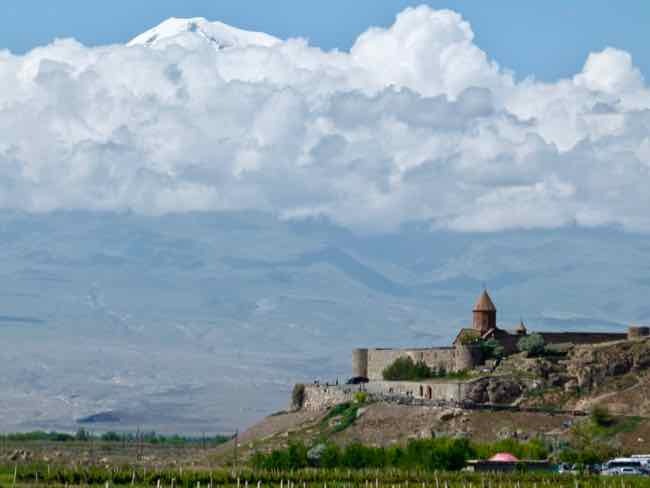 …and the Khor Virap Monastery with Mount Ararat very close…. You are right on the border with Turkey. 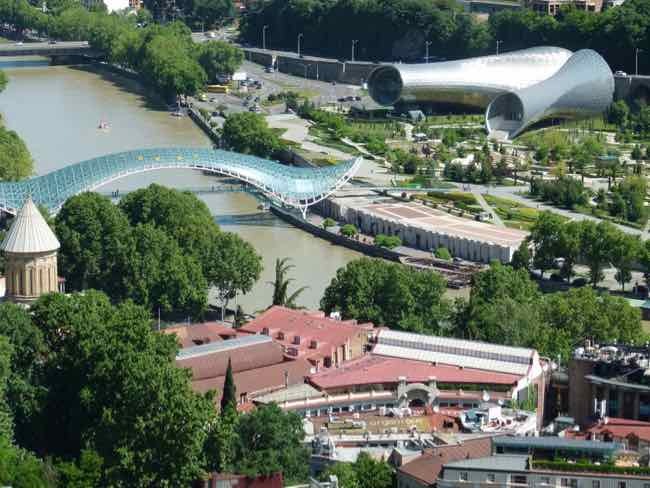 Yerevan is modern too with a lively restaurant and cafe scene. 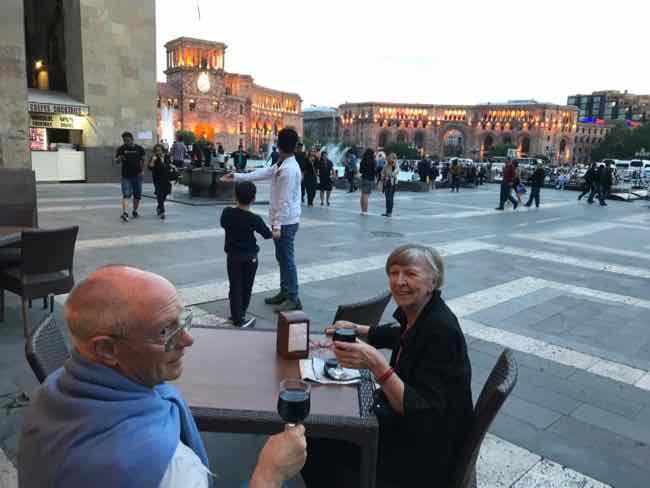 There are plenty of places to sit outside and enjoy the city… even on the main Republic Square. Do You Want To Visit The Caucasus Now? All of the capital cities felt safe and would be easy to travel in on your own, but we were happy to have help getting to some of the more remote destinations. Some of those rural roads are not as well marked… some were dirt, and some of the areas that are still in dispute are just not safe to travel in. We drove close to those areas at times, but our drivers knew which areas we needed to stay away from. When we went it was not possible to travel directly from Azerbaijan to Armenia. There are some land disputes going on and the borders are closed. When we entered Armenia from Georgia, the border patrol gave us some grief just because we had been in Azerbaijan at the beginning of our trip… then we were very glad to have a local guide who could speak up for us! We always felt safe, and we had fun. 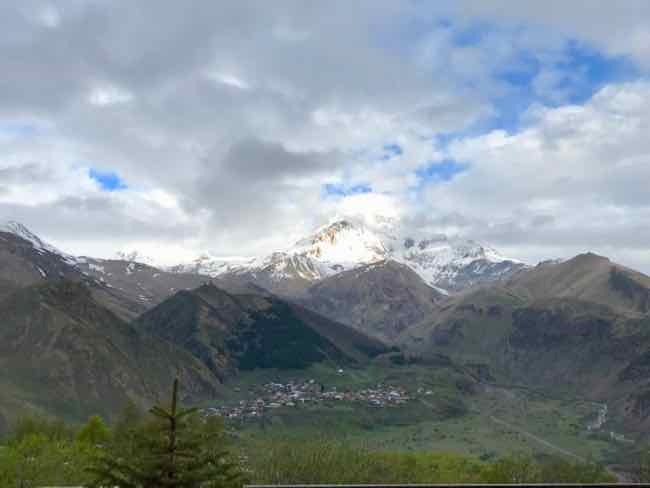 We hope this gives you a glimpse of what to expect in the Caucasus counties… and makes you want to explore. We love seeing areas of the world we don’t know much about. Do you?